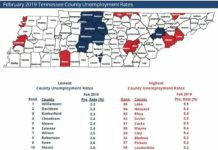 UPPER CUMBERLAND – Unemployment rates were up all around – nationally, in Tennessee and in the Upper Cumberland. One UC county ranked as one of the top 10 highest rates in the state – number 90 of 95 was Clay county at 6.2 percent. Two counties, Cannon and Macon, were listed in the top 10 lowest rates at number eight with 3.0 percent and number 10 with 3.1 percent, respectively. Both counties are included in the Nashville-Murfreesboro metropolitan statistical area (MSA). 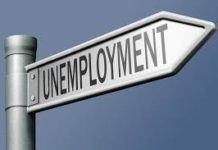 The state unemployment rate was 3.7 percent and the national rate was 4.4 percent. Three UC counties were below the state rate, Cannon, Macon and Smith (3.4 percent). Putnam County was tied with the state rate at 3.7 percent. 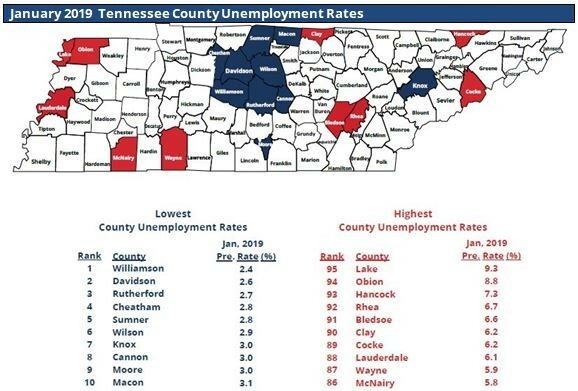 “Many counties did experience an uptick in unemployment in January, but when you look at year-to-year comparison, the vast majority of Tennessee’s counties has lower unemployment compared to January of last year,” said TDLWD Commissioner Jeff McCord. Three UC counties did experience bumps over 2018 numbers: Clay from 6.1 percent to 6.2 percent; Pickett from 4.6 percent to 5.6 percent; and Van Buren from 5.0 percent to 5.4 percent. Jackson and Overton remained the same as in 2018 at 5.5 percent and 4.7 percent, respectively. Rates for the other counties in the Upper Cumberland region were Cumberland (5.4), DeKalb (4.8), Fentress (4.5), Warren (4.1) and White (3.8). Numbers for February will be released later in March.